TRUELINK 4 Power doesn’t need space! Videomed introduces a new jewel for OR integration systems. Truelink 4. Four key points makes this system a revolution in terms of flexibility and technical capabilities: the most compact and powerful OR integration system ever made. 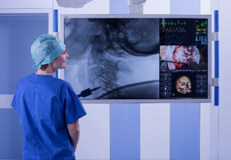 Truelink 4 combines advanced solutions in OR videomanagement with innovative features to improve surgical team ergonomics and patient's safety. 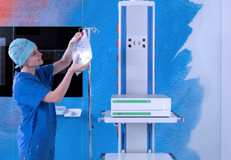 The 5.25-inch height unit makes this the only system truly compatible for installations outside and inside the operating room. The unit can be easily placed on a boom shelf without the need for external cabling and complex spaces. A technological achievement never reached before. Videomed always works to make available to its customers video technologies designed specifically for use in surgery. We are totally focused on the study and development of modern solutions: a pioneering partner at your side. Truelink 4 can manage up to 25 input and 25 output video signals, can record two channels simultaneously and may share over network up to four signals at the same time in Streaming and Video Conference. A special medical grade video infrastructure transmits to the monitors with zero latency, to ensure perfect movement and coordination in endoscopic procedures. 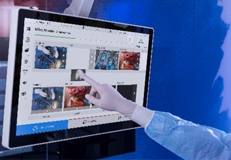 Truelink 4 offers compatibility with all the video standards inside an operating room, from old analog signals to new UHD and 4K: maximum flexibility for upcoming demands. Conference and Streaming functionalities connect the operating room with the outside world for different purposes: telemedicine, consulting, teaching and multiconferencing. Truelink 4 has an unmatched processing power that allows you to think about tomorrow while being confident that you are already in line with the standards of the future. 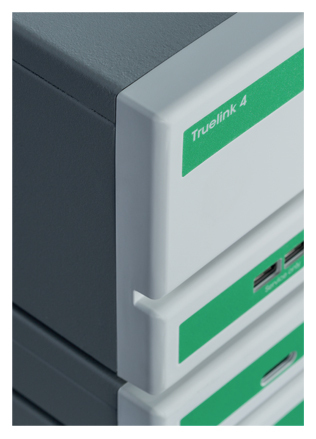 Highest processing power and smallest space footprint: Truelink 4 Main Unit is only 5.25-inch in height. 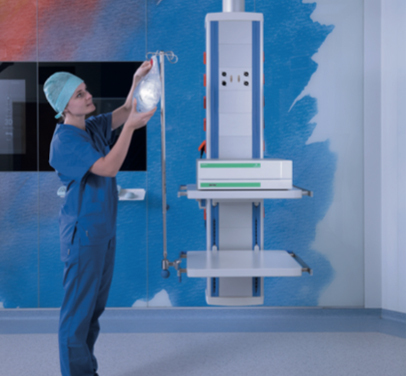 A cutting-edge integrated OR Systems in the size of an electrosurgical unit. Thanks to the minimum space required, Truelink 4 can be easily installed on a boom shelf, significantly simplifying the installation process and technical room needs. Thanks to a modular concept, Truelink 4 can be expanded with Conference and UHD Units to reach a maximum of 5 rack-units of space. 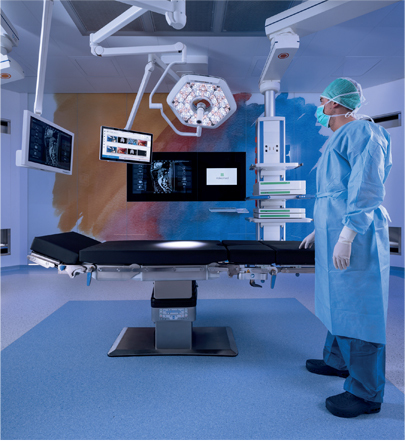 A smart Italian design completes this technological jewel, introducing an elegant device within each operating room. The best definition available today, 4K/UHD with full 3D support, for a level of detail never seen before. Moreover, thanks to Time Shift Recording, Truelink 4 can record going back one or five minutes or even to the start of the procedure. The new M.A.T.S. function automatically creates a video collection of salient surgical moments. 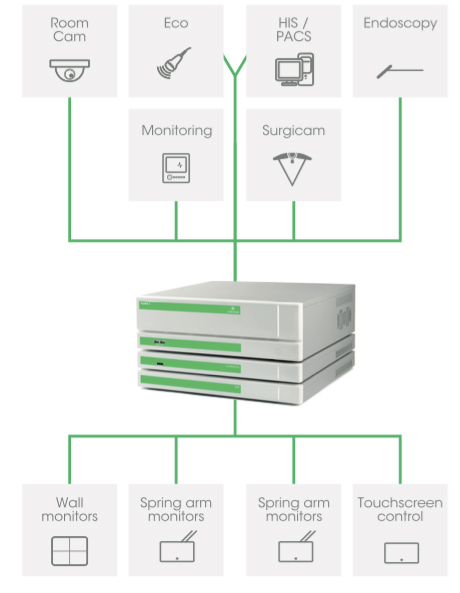 Multiple network communication options can run simultaneously to connect the operating room via Streaming or Conference. 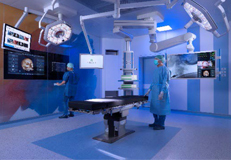 Truelink 4 is focused on top-level performance to improve your surgical daily work. Truelink 4 offers a simple and intuitive interface, to achieve excellent performance with minimal effort. The touchscreen control is equipped with convenient "drag and drop" actions to activate the most critical functions. A color code interface helps users to clearly distinguish different functionalities and quickly access the desired commands. Video Routing page shows convenient preview of every source and destination to have everything under control in every condition. A smart Presets section collects the most used setups, to be activated with a simple click. Control of DICOM images can be performed during surgery from a dedicated Workstation or via sterile touchless gestures thanks to exclusive Fluid System. Perfection is measured in terms of simplicity. Video Routing unit is the heart of Truelink 4. 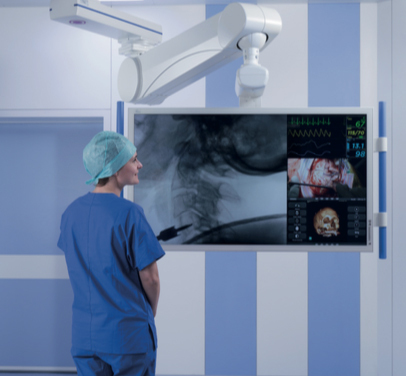 A dedicated medical grade solution that can handle up to 25 video sources, with resolutions in line with new upcoming standards like 4K and UHD. Unique Videomed technologies allows to transmit video over CAT6 or optical fiber without any external powered box: a solution that realizes simple installation setups, with reduced cabling demands. The extremely compact size of only 3 rack units allows installation on a boom shelf. A built-in audio mixing unit controls ceiling speakers and Recording / Conferencing audio transmission. The Video Routing unit includes also DICOM/HL7 synchronization for EMR patient ID, Surgical checklist, Presets page, Room Camera Control, Device and Surgical Camera Controls and PiP/PaP multiviewer. All these features in only 5.25-inches. Truelink 4 offers new innovative solutions for recording A/V signals: a double channel system offers the possibility to record two independent sources simultaneously, in 1080p resolution with infrastructure ready for 4K. A Time Shift Recording (TSR) function allows surgeons to record in different modalities: from that point forward, 1-5 minutes back or from beginning of procedure. The M.A.T.S. (Movie Around the Snap) system can automatically create videos with programmable length around recorded pictures. All these functionalities to give you a new, smarter way to track the surgical activity. Truelink 4 Conference Unit is the gateway that connects you with the outside world. The quality of transmission is ensured by a forefront hardware encoding system, with bidirectional audio/ video communication. 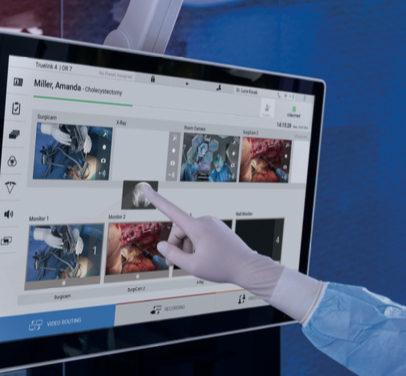 With the Dual Video functionality, surgeons can send simultaneously two different video channels, which can be displayed at destination on separate monitors or as picture in picture. All conference controls are in the hands of the operator inside the OR, through a simple user interface offering selection of sources, destinations, address book, personal dashboard with recent calls and live preview of the remote station connected.